OGO helps clients design and implement backup and production ISP. 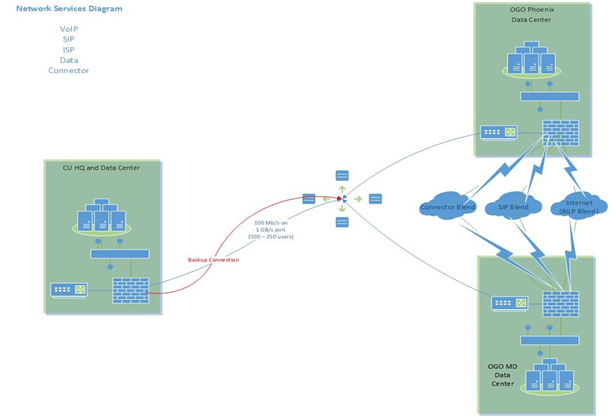 OGO will create the network diagram, provision the ISP, configure the routers/firewalls, and setup performance monitoring for the ISP service. Why Do I Need It? If you have a website, third-party connections, or employees that want to work from home – you need ISP services. A blend of ISP providers enables a high confidence that the circuits will stay up and that you will continue to provide access to key services. Why OGO? OGO’s buys more bandwidth than almost anyone else in the CU industry. This enables us to get great pricing and more diverse carriers leading to higher up-time.